Guilty Displeasures: Super Hero Squad: Marvel doesn't think that girls like superheroes? Super Hero Squad: Marvel doesn't think that girls like superheroes? Problem, the first: it is really hard to find age-appropriate superhero comics. I don't mean that in terms of violence, even, so much as I do accessibility. Even the Bruce Timm-styled DC Adventure stories, while generally tame and invitingly cartoony, feature storytelling that's as complex and dialogue bubbles that are as dense as most adult comics. 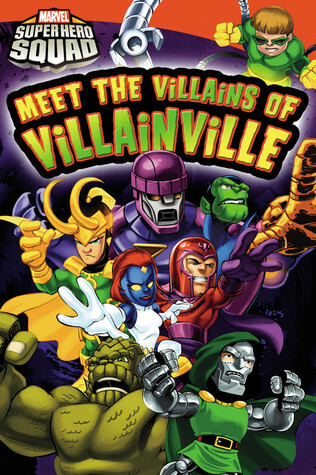 That leaves us with relatively few options, in terms of superhero stories that are pitched at a pre-schooler's level - only DC's Tiny Titans and Marvel's Super Hero Squad, really. I bought Penelope a Tiny Titans book a few months ago. She liked it, but aside from Batgirl she doesn't really know the characters. I can remember being personally impressed with the wide range of faces that were included - not much in terms of volume, mind you, but it's something - but she'd be much more impressed with stories that included Spider-man, Captain America, and/or Iron Man. So, as you can imagine, I was pretty thrilled when I found a used Super Hero Squad book. And then, a day later, I found three more. Now, I suppose we should at least exclude the Sentinel, who is clearly inhuman, and at least some of the other inhuman or monstrous characters. But regardless - of the remaining 20 or so characters, there's a single blue woman and a single black man. 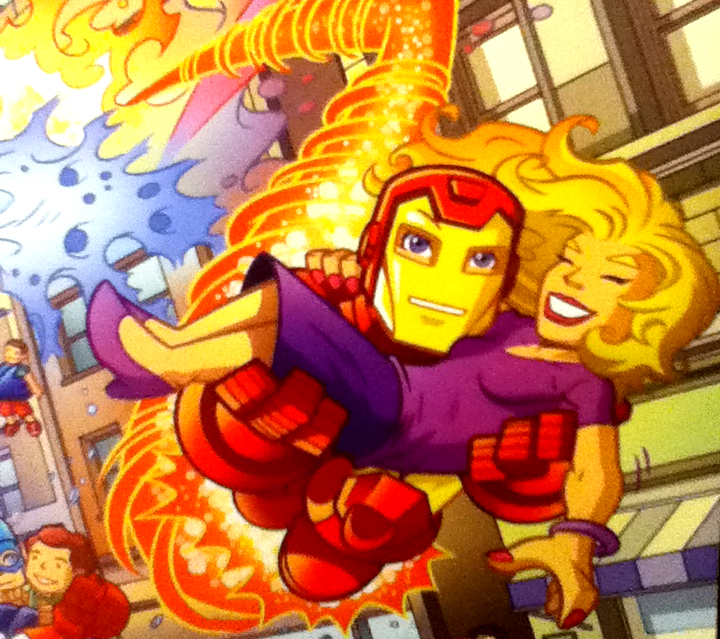 If we want to expand our range to look at the victims and various other background characters, each of those numbers double - Iron Man saves a white woman from a burning building, while a black man appears to be escaping the same building in the background. And that's it. Ugh. One of the things that I address with my students when we talk about pop culture and representation is the feeling that's created when you can't see yourself - your gender, your race - in the stories that are being told to you. (And conversely, of course, the privilege that comes from being able to see yourself in everything.) This stuff? This is exactly the sort of stuff that I would talk about with them. I want my daughter to read superhero stories. But I also want her to read stories that allow her to see herself in the characters. In these four Super Hero Squad stories, that would seem to restrict her to either a shape-changing villain or a damsel-in-distress. At a minimum, that's sad. And, of course, it could always be worse - if she weren't white, she wouldn't see any representations of herself at all. Update: On a somewhat related note, here's an example of how Marvel genders superhero shirts for kids. I am not impressed.